The dog was discovered in the back of a van with a note on her collar saying "My name is Valerie and I'm six months old, take me too." The young German Shepherd was found in a windowless vehicle in the Watford area of London, according to the Dogs Trust. The people who found Valerie took her home for a night before passing her on to Dogs Trust Harefield to help her find a new home. Sian Fairle, supporter relations officer at Dogs Trust Harefield, says the dog had endured a "rough" start to life but despite this she is a very happy puppy. She would suit a lively family who can offer her lots of exercise and entertainment. 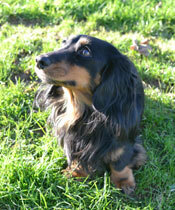 Mrs Fairle adds that she loves excitable cuddles and meeting new dogs and people. According to the Dogs Trust, she would be better suited to a family with children over six owing to her energetic nature.